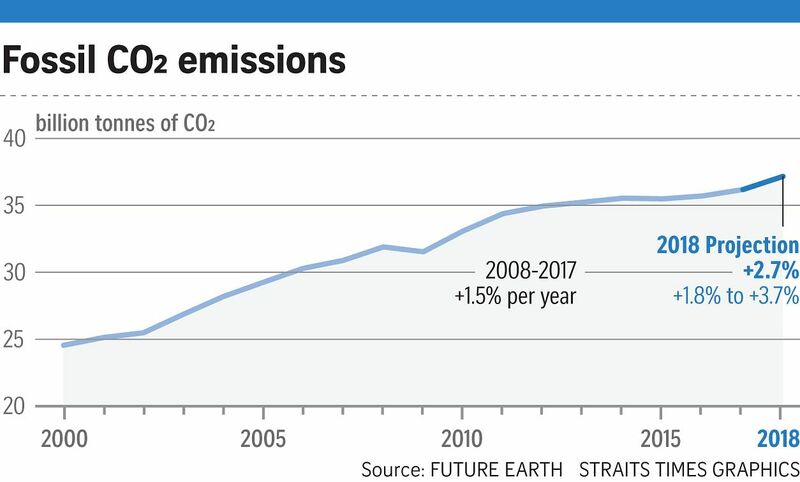 Global emissions of carbon dioxide (CO2) powered ahead this year, and are on course to reach a new record, deepening the challenge the world faces in trying to limit the impacts of climate change. CO2 is the main greenhouse gas that is heating up the atmosphere and oceans, fuelling more extreme weather and rising sea levels. About 80 per cent of global CO2 emissions come from burning coal, oil and gas, with coal use in power stations a major source. In its latest annual assessment, published today, the Global Carbon Project (GCP) says global CO2 emissions from fossil fuels and industry are projected to rise 2.7 per cent, with China and India accounting for much of the increase, with a rise in coal CO2 emissions. The strong growth is the second consecutive year of increasing emissions after flatlining in 2014 to 2016 and comes as delegates from nearly 200 nations are meeting in Poland to try to agree on a crucial rule book that will put the 2015 Paris Climate Agreement into action. Pressure is growing on negotiators and governments after a series of scientific reports in recent weeks spelled out the peril the world faces if CO2 and other greenhouse gas emissions are not cut drastically by 2030 to limit the damage from stronger storms, floods, heatwaves and droughts. Another year of CO2 growth - to a record 37.1 billion tonnes this year - makes the goals of the Paris Climate Agreement to limit warming to below 2 deg C or even 1.5 deg C, that much harder to achieve. Emissions rose 1.6 per cent last year and are likely to increase further next year, the GCP says in the assessment, published in several scientific journals, including Nature. The reason was the return to strong global economic growth. "The 2018 rise in fossil fuel CO2 emissions places us on a trajectory for warming that is currently well beyond 1.5 deg C," said lead researcher Corinne Le Quere, director of the Tyndall Centre for Climate Change Research at the University of East Anglia. The GCP brings together scientists who use climate and industrial data from around the world to develop a comprehensive picture of greenhouse gas emissions. The authors found that rising coal use fuelled some of the increase this year, though globally CO2 emissions from coal are still slightly lower than a peak in 2013. China is the world's top CO2 emitter and largest coal consumer, and it relies on coal for about 60 per cent of its power generation. But it is also the world's top renewable energy investor. India is also heavily reliant on coal, though investment in coal has been declining while renewables are growing quickly from a low base. "The biggest change in CO2 emissions in 2018 compared with 2017 is a substantial increase in both energy consumption and CO2 emissions in China," the authors say. The GCP said China's CO2 emissions were predicted to grow nearly 5 per cent this year, India about 6.3 per cent and US about 2.5 per cent, after several years of decline. Dr Josep Canadell, the GCP's executive director, said the numbers show how closely tied the world economy still is to fossil fuels. He said the recent uptick in global growth meant major economies are relying on readily available coal, oil and gas and that the rapid growth in renewables, from a low base, still is not enough to meet demand growth for energy. "We're still years away from having renewable energy to truly be replacing and fulfilling the demand for new energy," he told The Straits Times. But the good news is that "we have now renewable energy capacity which is doubling every four years", he said. And coal seems to be on the way out globally, albeit still slowly. The US, for instance, has been shutting down coal-fired plants and switching to gas and renewables. "We are not going back to growth in global coal emissions but certainly we're not stopping natural gas and oil emissions any time soon," Dr Canadell said.